Open Networking Summits, Inc. (ONS) represents the industry’s premier and only non-profit conference that brings together the entire networking ecosystem to discuss advances in software-defined networking (SDN), OpenFlow, and network functions virtualization (NFV). ONS is proud to announce Brocade and its “Real-Time SDN Analytics for DDoS Mitigation” OpenFlow application as the winner of SDN Idol 2014. SDN Idol is a fun, friendly competition that showcases disruptive SDN technologies, products or use cases from exhibitors at the Open Networking Summit 2014. This year’s SDN Idol went beyond slide-ware and instead provided live demonstrations for an audience that boasts of technologists, executives, investors and end-users highly-focused on SDN. The finalists were chosen by a select panel of industry experts and judged on the following criteria: Business Value, Technology Value, Differentiation against competition, Advancement of overall SDN and Demo. The finalists presented live demos on Monday, March 3rd at the SDN Idol Demo Track, part of the main conference program and attendees voted to crown the winner. Andrew Conry-Murray, Director of Content & Community, Interop. Jason Edelman, Principal Solutions Architect, Presidio. Leon Poutievski, Staff Networking Software Engineer, Google. Jim Smith, General Partner, Mohr Davidow Ventures. 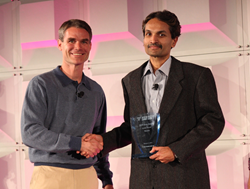 The SDN Idol Award was presented to Brocade on March 5, during the Open Networking Summit 2014. The conference attracted around 1,600 attendees from around the world and had a sold out exhibit hall with more than 60 SDN exhibits. The number, size, and type of DDoS attacks have exploded over the last several years, with an increasing majority now targeting data centers and customer networks. Traditional DDoS solutions are unable to respond in time or handle the shear bandwidth that these attacks pose on today’s networks. Both service providers and enterprises need a scalable solution that can detect and mitigate these behavioral security threats immediately preventing them from spreading through the data center and disrupting the services of customers and users. The Real-Time SDN Analytics for DDoS Mitigation application from Brocade provides an efficient and high-performance solution to protect data centers and customer networks from these brute-force attacks. In return, Service Providers and Internet Exchanges can offer value added Layer 2-4 DDoS mitigation services to their customers for added protection. The application, leveraging sFlow, OpenFlow 1.3, InMon sFlow-RT and an OpenDaylight framework, treats long-lived large flows caused by DDoS attacks separately from other Layer 2-4 flows. Hardware support for sFlow standard in the MLXe routers provides scalable, line rate, monitoring. InMon Corporation’s analytics software is an important part of the solution, using the sFlow measurements to automatically recognizes long-lived large Layer 2-4 flows in real-time, and notifying the DDoS mitigation application of new attacks. When an attack happens, the application, within seconds, instructs the network comprised of OpenFlow-enabled Brocade MLXe Routers to rate limit or drop the attack traffic flow in hardware without affecting the performance of the system or network. In addition, the industry’s only true hybrid port mode for OpenFlow allows the rest of the network to behave as normal, so this solution can be seamlessly integrated with existing infrastructures today. With this application, service providers can offer tiered DDoS services to customers and enterprises can have stronger DDoS mitigation more efficiently. With a mission to transform networking, the non-profit ONS is exclusively committed to bringing together the thought leaders, luminaries, creators, and innovators of SDN and OpenFlow to lead the development of the networks of tomorrow. Founded in 2011, ONS produces conferences that attract participants from around the world, who come to discuss, share and shape the future of networking. Through exhibitions, demonstrations, visionary talks, technology tutorials and networking opportunities, ONS helps facilitate the understanding and dialogues that drive the advancements and adoption of new networking technologies.